Here’s a collection of what he’s sent over the last couple of weeks to give some flavor of how busy life has been for our local winemakers. Cabernet Sauvignon grapes from Cave B Vineyards. Every year around this time I see posts on Facebook and email updates from our local winemakers. Many of them are making regular trips to Eastern Washington to harvest grapes and check the conditions of their vineyard blocks to determine the best time to pull the clusters from the vines. I’ve always wanted to get a report from them about how harvest is going and to hear their initial projections about the vintage, but never want to bother them since I know they’re busy and running on minimal sleep. This year I took a chance and sent an email to the winemakers of Bainbridge Island (Amelia Wynn Winery, Eagle Harbor Wine Company, Eleven Winery, Fletcher Bay Winery, Rolling Bay Winery) and Mosquito Fleet Winery in Belfair to see if they’d be interested in sending me email updates of how things are going in the field. I haven’t heard back from everyone, but a number of the winemakers wrote back almost immediately — some with reports from the field, others saying they would be sending me updates as harvest went along. My plan is to compose periodic blog posts that includes their reports from the field — either as a direct copy and paste from what they sent me, or my summary of what they have to say. I was surprised to hear that a number of white grapes have been harvested and are already back on the peninsula fermenting. Matt Albee, winemaker for Eleven Winery, said his Sauvignon Blanc and Pinot Grigio grapes were about two weeks ahead of schedule this year. Below is a list of the wineries I’ve heard back from and quick summaries of how things are going. 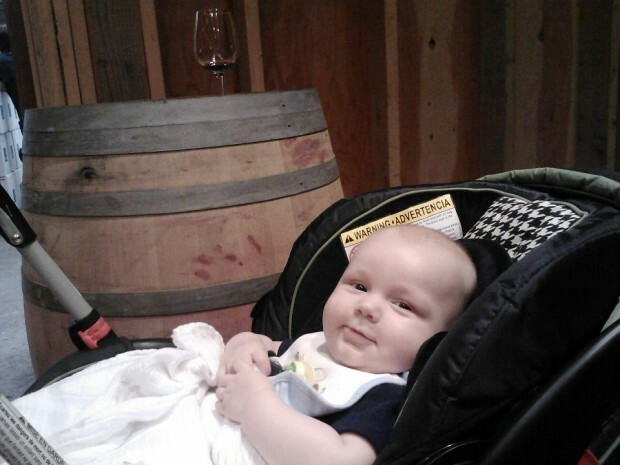 As you’ll see, Amelia Wynn winemaker Paul Bianchi has supplied a great report from the field. I’ve copied and pasted his emails so you can see the life of the local winemaker around this time of year. Timing is everything at harvest and plans take shape over weeks. When it’s time to pull the trigger the vintner puts the vineyard on notice for an agreed upon harvest date. The players are: vineyard owner, vineyard manager (if not the owner), picking crew being paid by the pound, the custom crush facility (if used) and most importantly the truck rental agency because you need a big truck if you’re hauling more than 5,000 lbs. This Sunday (Sept. 15) in Walla Walla it was 95 degrees with 20 mph drying winds. Not a good day for grapes. So the green light was given to pick on Tuesday (Sept. 16). Predicted light showers turned out to be heavier than anticipated, complicating the day. 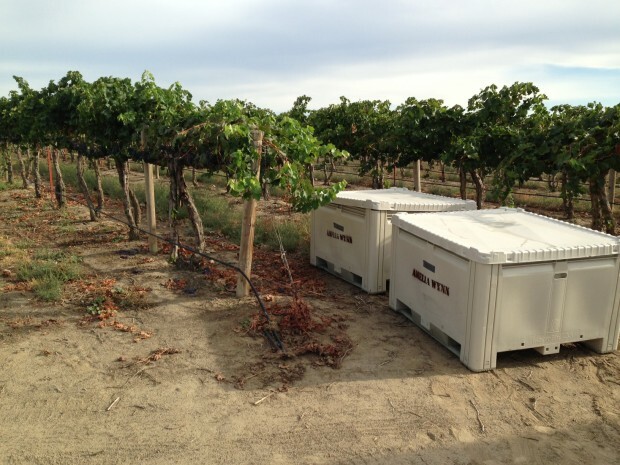 All grape bins were covered and because the crush schedule got screwed up, our Merlot was to be destemmed around 11 p.m., making for a very long day for the crush crew. 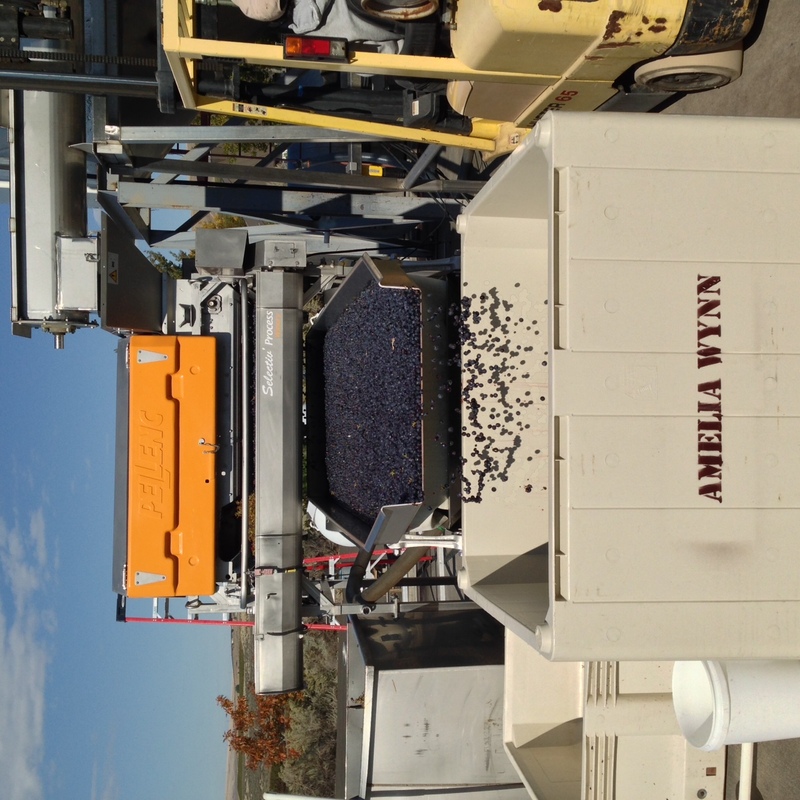 We have to be at Artifex at 8 a.m. Wednesday (Sept. 18) to pick up the destemmed grapes and then drive west to Prosser to press the Cab Franc and Viognier. The latter I need to pick up at the Elerding vineyard. The pick date for the Viognier was established last week and all players were put in motion. 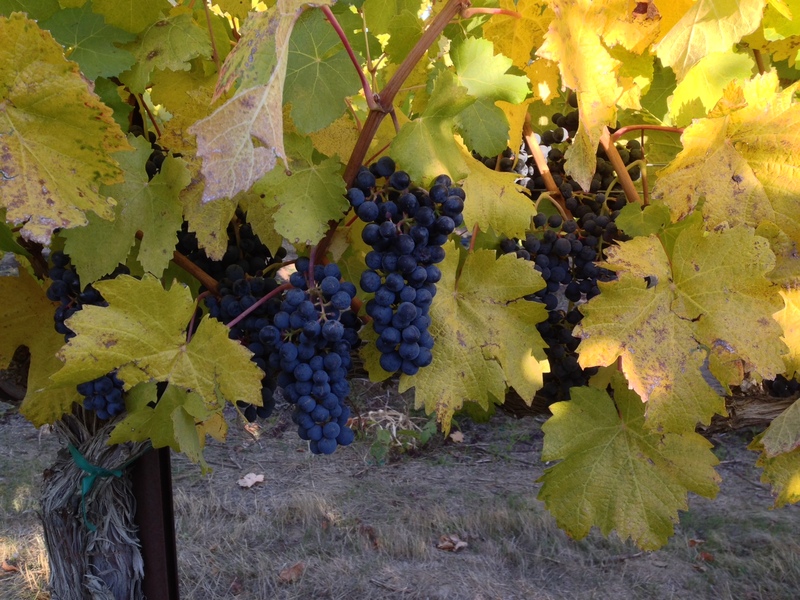 The Cab Franc was given a green light Sept. 16 to be picked on the same day as the Viognier. The intent is to make a 500 mile truck rental, two nights on the road, and use of commercial equipment as efficient as possible. What has gone down toward the end of the 2013 harvest is: A record-setting hot summer has skidded to a slow walk with a cooling trend that is in fact a relief because the grape varieties were rippening too close together as a result of the high temperatures. With a cooling period the wineries can pace the harvest dates so work in the winery is not chaotic. When I return to the island tomorrow night (Sept. 18), I will have the following grapes fermenting or preparing to ferment: Sauvignon Blanc, Chardonnay, Cab Franc Rose, Viognier and two clones of Merlot from Walla Walla. Monday: catching the 8:10 p.m. ferry and arriving in Prosser at midnight, staying at the Best Western. 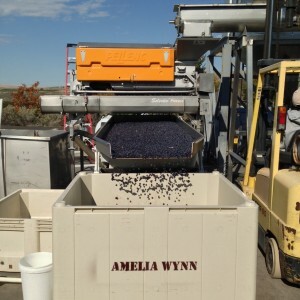 In the morning dropping off bins for Cab Franc, which will be picked and pressed on Wednesday (Sept. 18) for a Rosé. 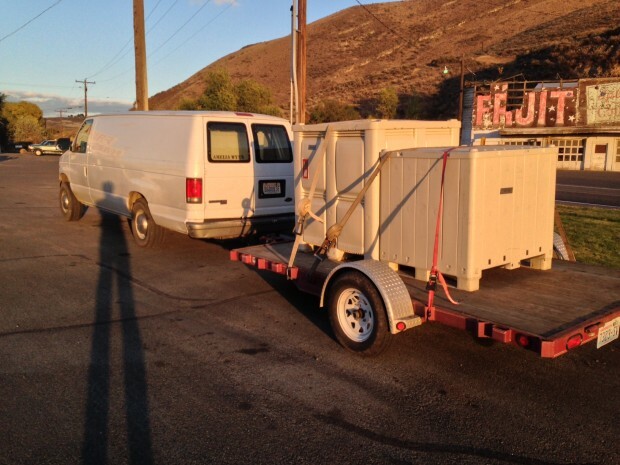 Also dropped off two 275 gal juice totes where the cab franc will be pressed as well as 4,000 lbs of Viognier. Drove on to Walla Walla where we will pick up 3 tons of Merlot and have destemmed at Artifex, a custom crush facility. 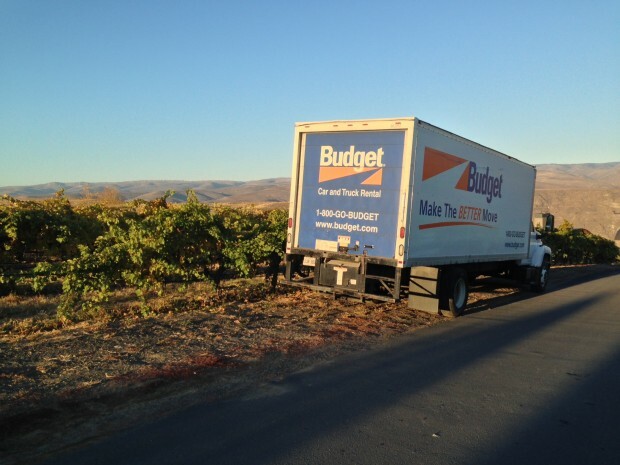 Sept. 18 back on the road to Prosser where we will pick up 2 tons of Viognier at Elerding vineyard and then to Kestral winery where the Cab Franc and Viognier will be slowly pressed in a membrane press. I have Sauv Blanc and Pinot Grigio fermenting, and am leaving tonight (Sept. 16) to pick Viognier tomorrow (Sept. 17); Roussanne/Marsanne and Syrah on Thursday (Sept. 19). The very hot summer perhaps favors later-ripening varieties like Cabs and Mourvedre, but so far everything is good quality! We picked Sauvignon Blanc on Aug. 29, Pinot Grigio on Sept. 9 (originally scheduled for Sept. 4, but pushed back due to forecast of rain, which ended up not hitting our vineyard). This week we will see if last week’s extreme heat had much impact. There seems to have been a lot of rain for September in Eastern WA, but my sources have largely been spared (whew!). 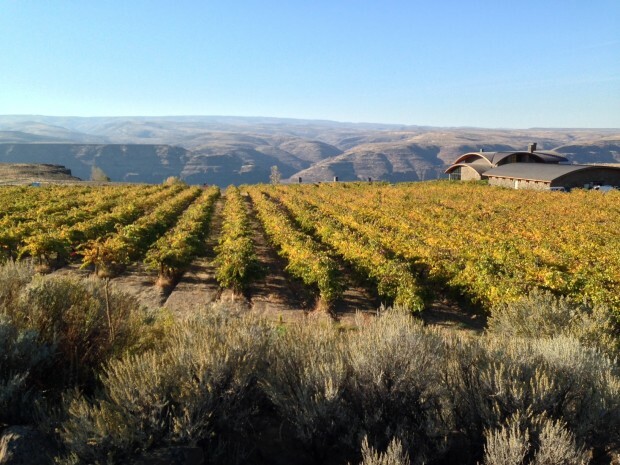 My plans for harvest this year include: Tara Rouge ( Merlot, Cabernet Franc, Cabernet Sauvignon), a Walla Walla Cab Sauv, a Red Moutain Zinfandel, a dry Rose, Semillion and a Pinot Grigio. Pinot Grigio is being picked, everything else is still on the vine. The 2013 harvest is looking fantastic! It will be our largest local harvest to date. The Frambelle is done fermenting, it’s tasting superb already. We will be getting an excellent harvest of Melon de Bourgogne, so mid-2014 we’ll have our signature wine available again! The vineyard is mostly done with for the year, at this point we’re mostly just waiting for Mother Nature to finish the job of ripening. We do still have to spray for Botrytis mold, but other than that it’s just trying to catch up on weeding. It’s a beautiful time to visit the vineyard as the grapes have gone through veraison, meaning they ‘re ripening and turning color. From Facebook: Mike said they harvested the Siegerrebe Sept. 8. Crush has just begun for us here at MFW and we are excited! We brought in a couple tons of our first white: A Viognier from Elephant Mountain. The fruit is very nice, tremendous flavors and great acids. We will only be producing around 100 cases of Viognier this year. Partially fermented in stainless steel tank and partial barrel fermentation, which we will ferment and age sur lie and go through malolactic fermentation. This Thursday (Sept. 19) we are bringing in Merlot from Double Canyon Vineyard and on Saturday (Sept. 21) we will bring in our first Malbec off Elephant Mountain as well. We are looking forward to this too. We have increased our Pepper Bridge Vineyard fruit and we are now sourcing Merlot and Cabernet Sauvignon from there as well. The PB Merlot will be ready in about a week. Then it’s Cab Franc, Cabernet Sauvignon and Touriga Nacional for our Port. It will get very, very busy here shortly. Last weekend we dusted off our wine glasses in preparation of our first joint tasting event where we could both do some serious tasting — while Brynn is still out on maternity leave she was able to get away to Bainbridge Island for a couple of hours for the Bainbridge Uncorked event. We had the chance to attend a VIP event held Friday evening before the main event got started, giving us ample time to jump from table to table and to chat up each of the seven winemakers that were on hand to pour their wines. The Cuvee is a beautiful blend of 62 percent Cab, 27 percent Merlot, and 11 percent Petit Verdot. The color is deep and rich with a black cherry and plum upfront and then wonderful mineral and herb aromas. This all comes together to produce a very balanced wine. This is the wine’s second year as a Double Gold Medal winner. We love this Sangiovese, from its nose of cherries and herbs, the refreshing acidity, the balanced cherry, fruit and herbs, to the silky finish. A blend of Red Mountain’s Kiona Vineyard Sangiovese with a dollop of Merlot from the Vista Vineyard in Columbia Valley. This is a definite must try! And coming in 2013, winemaker Paul Bianchi will release a Sangiovese Rose. Here’s a blend of all winemaker Matt Albee’s reds that he sources from Horse Heaven Hills. This version is Syrah (44 percent), Mourvedre (22 percent), Petite Verdot (22 percent) and Malbec (11 percent). It has a perfumed nose of raspberry and strawberry. On the palate, this purple-black wine is rich in texture and has a beautiful finish that matches the nose. 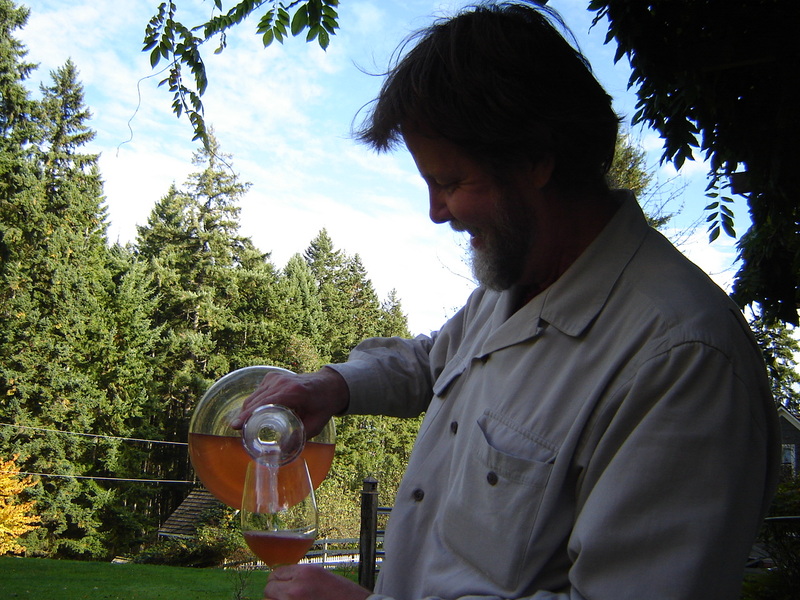 We tasted Albee’s 2011 Roussanne made from 10-year-old vines off Elephant Mountain. What a gorgeous wine. It’s aromatic with a rich, unctuous feel. The full-bodied wine is floral with lemon and pear fruit flavors. It is so delicious. But hurry; there are only 90 cases of this gem. Winemaker Alphonse de Klerk’s Cuvee this year is a blend of 78 percent Cab, 12 percent Cab Franc, and 10 percent Merlot. This blend is dominated by an herbal Cabernet with notes of dark cherry and plum from the Cab Franc and Merlot. The finish is more herbal than fruit so we’d pair this one with a steak that has plenty of grilled green peppers or even pesto. This was a hot year on the south facing slopes of Snipes Mountain. And as a result, this wine is fruit-forward with lots of blackberry and plum flavors. It has a heady floral aroma and a deep purple hue. Almost two years in French oak, this medium-bodied wine has soft tannins. It would be a great pairing with grilled baby back ribs. While he wasn’t listed in the Seattle Wine Awards, Wilford’s winemaking skills were recently honored at the New York International Wine Competition, where his wines were judged against others from around the world. 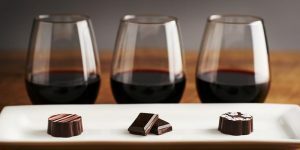 Washington Wine Month technically ended when the clock struck twelve on March 31, but because there are so many great Washington wines out there we’re sticking with the local theme for this week’s wine pairing. Normally we would recommend Chianti for this pairing; instead we’re going to recommend a Washington Sangiovese. But don’t let the names confuse you, Chianti is predominately made from the Sangiovese grape which is grown in the Chianti region of Italy. The region is formally recognized by the Denominazione di origine controllata — the second highest level of Italian wine appellations. The main ingredient in Ann Vogel’s three recipes is balsamic vinegar — also a delectable Tuscan treat — and that is why we’re sticking with this Italian grape variety. Sangiovese grapes have relatively thin skins, which means the wine features more of the fruit flavors than the tannins. As such Sangiovese is a fruity wine — notes of strawberry, blueberry and plum are noticeable — but its naturally high amounts of acidity lend a nice balance to produce a medium-bodied wine that can range from firm and elegant to somewhat of a powerhouse with a bitter finish, depending on how the wine is made. The climate in Eastern Washington supports the Sangiovese grape, which means it’s a wine that should be easy to find in the store. If you’re looking to support local wineries, Bainbridge Island’s Amelia Wynn Winery offers a Sangiovese, sourced from Eastern Washington vineyards. The winery’s 2008 Sangiovese was awarded a gold medal at the 2011 Seattle Wine Awards. Winemaker Paul Bianchi purchases his grapes from Kiona Vineyards in the Red Mountain AVA near Yakima. Amelia Wynn’s wines can be purchased at the Island Vintners Tasting Room in Winslow, online or at Pane D’Amore in Lynwood Center on the island. Price is $25. If you can’t make it to Bainbridge to purchase a Sangiovese for these dishes, we have some other suggestions. They include Arbor Crest Wine Cellars’ Sangiovese from Washington’s Wahluke Slope Vineyard ($22); Maryhill Winery’s award winning Sangiovese ($22); or San Juan Vineyards’ Sangiovese ($23). If you’d like a wine to pair with the strawberry balsamic recipe, consider a rose of Sangiovese — which is exactly what it sounds like, a rose wine made from the Sangiovese grape. Waterbrook Wines has a rose of Sangiovese with hints of strawberry and watermelon ($12-14) and so does Barnard Griffin ($12).